French designer, Guillaume Alan, designed this apartment in Paris with 360˚ views over the city, through a minimalist approach combined with a french tradition that applies to the interior, furniture and selection of art pieces. 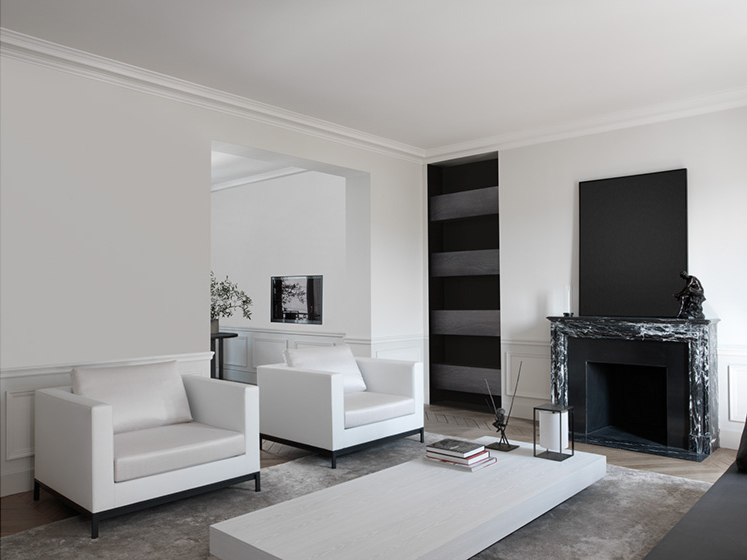 “Guillaume Alan signs this apartment in harmony with the finest tradition of French design and décorateurs ensembliers: he signed the architecture, the interior design, the pieces of furniture (everything is custom-made and drawn out) and selection of pieces of art. In Paris, a two-storey apartment on the last floor with a 360-degree view on the city, opening onto gardens. The tone is given: a haven of peace, like a "sanctuary". A gorgeous achievement combining luxury, calm and precision, where architecture and furniture are one. At 38 years old, based in Paris and in London, Guillaume Alan counts among the ambassadors of the French touch in the process of gaining international recognition. Through is work of global design, the young designer did not want to astonish here. Everything has been designed for a clam ann relaxing way of life according with the owners' needs. The architecture is pure, flawless and harmonious. The signature of Guillaume Alan: here, he rewrites the tradition of French classicism, and renews it using pure lines.